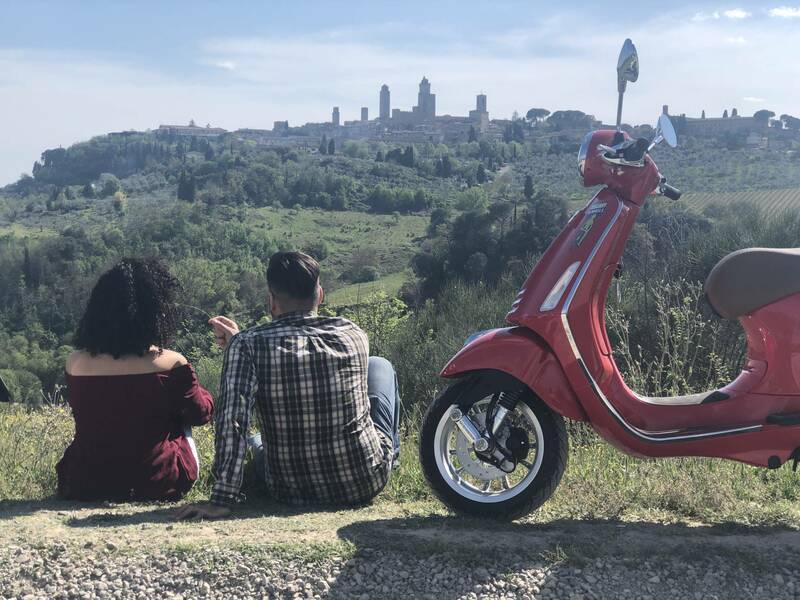 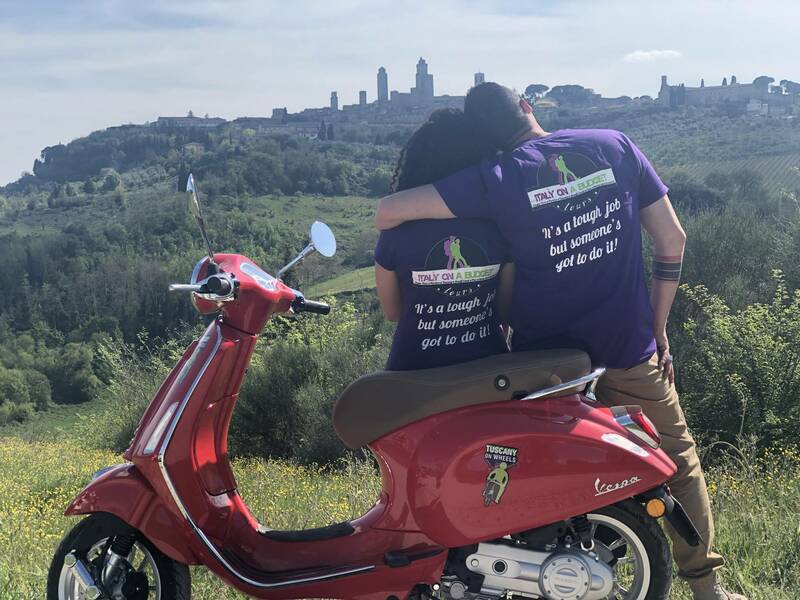 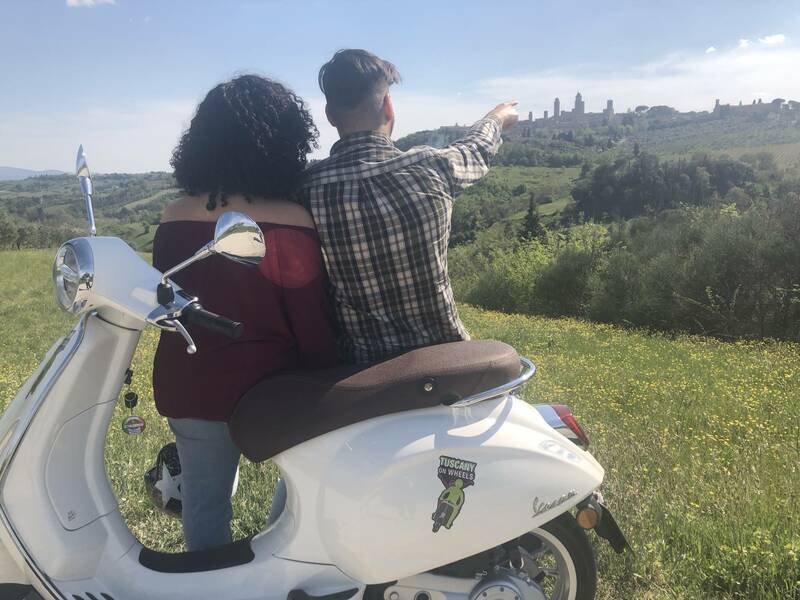 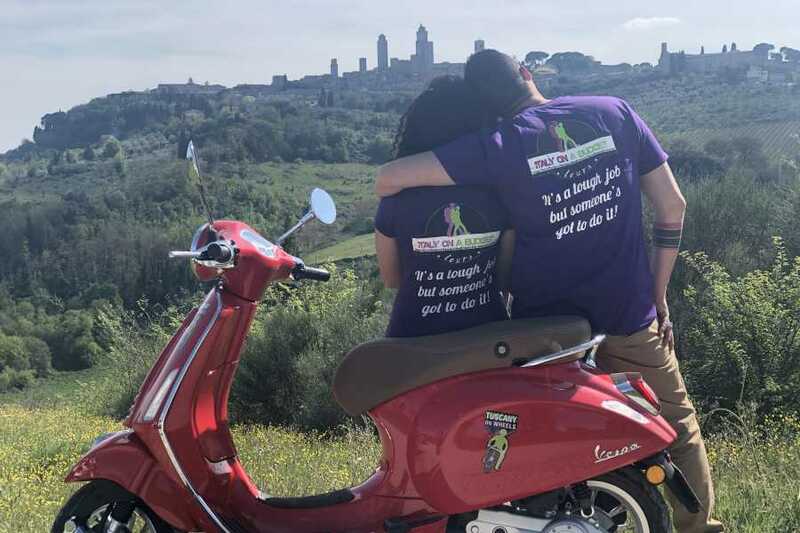 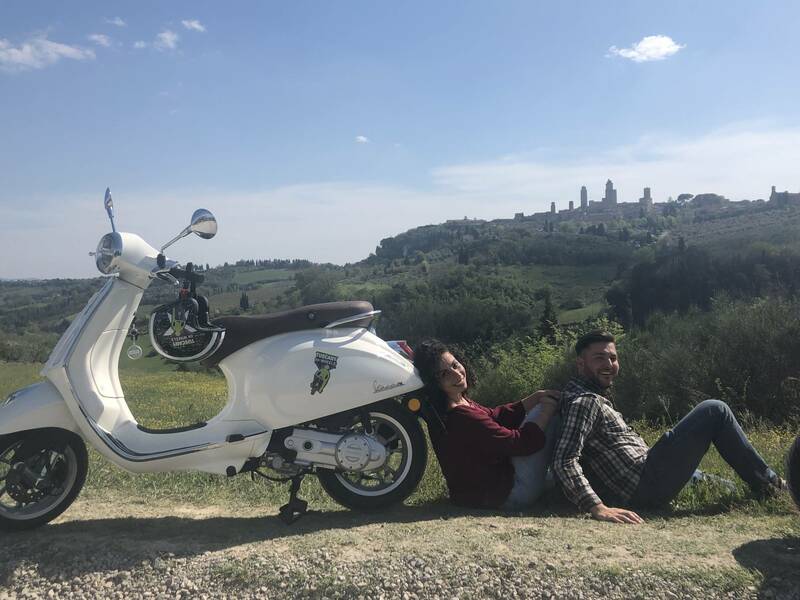 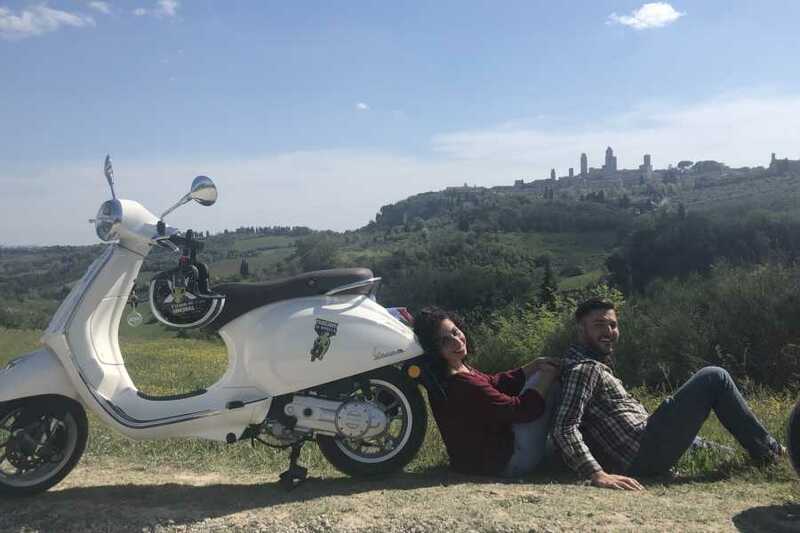 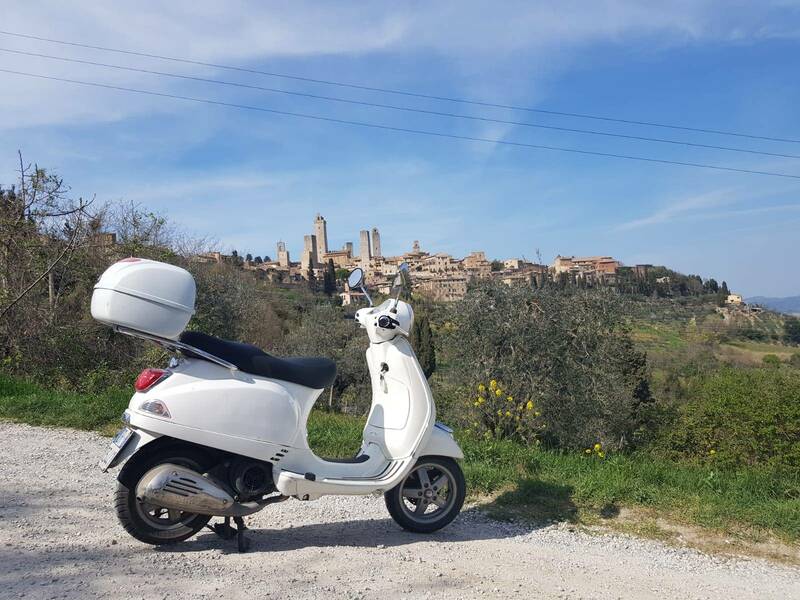 TUSCANY TOUR BY VESPA - Tuscany on a Budget, one of the Italy on a Budget tours' branches, is a travel company based in Florence and specialized in the youth travel 18-35 ‘s market. 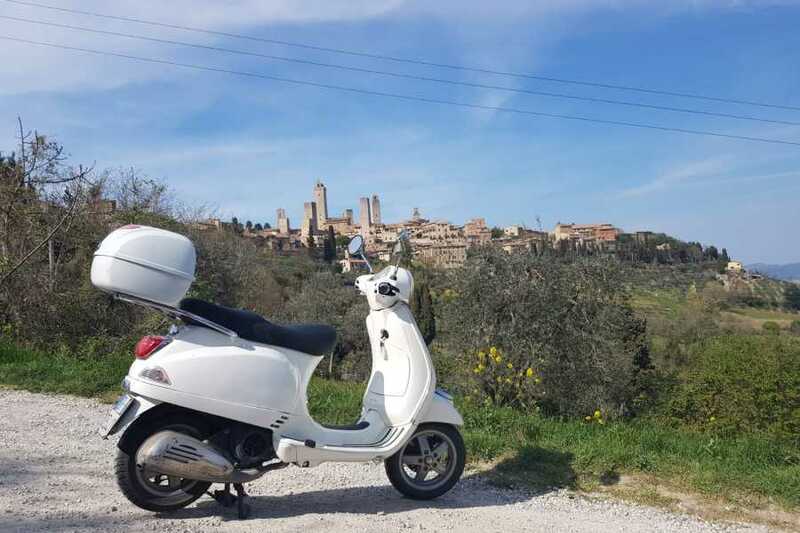 There is nothing more exciting than exploring Tuscany on board of an Italian vespa. 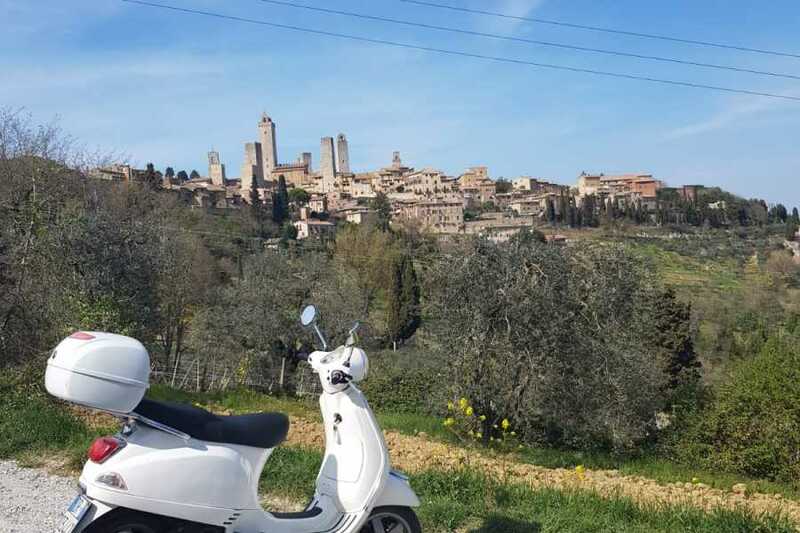 Join our day tour from Florence to the Chianti region and finally ride your vespa on the rolling hills of Tuscany. 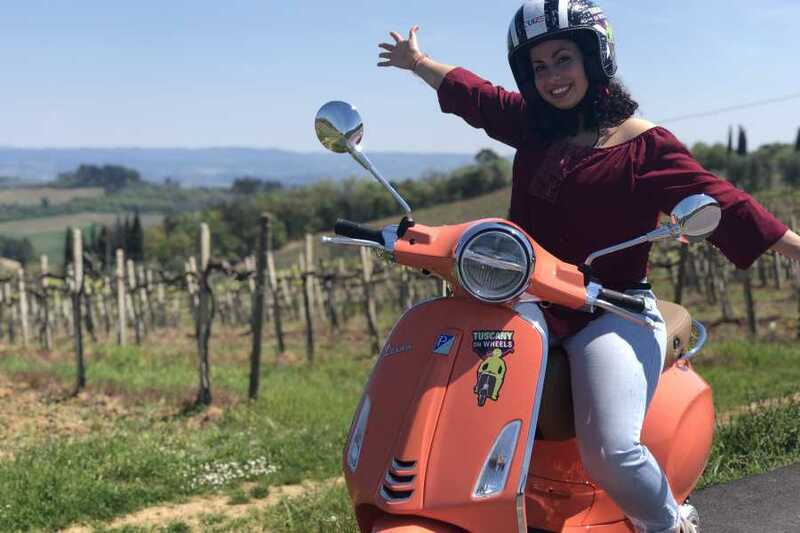 Enjoy the visit of one of the most beautiful Medieval villages in the area and the tour of a winery with lunch and wine tasting. 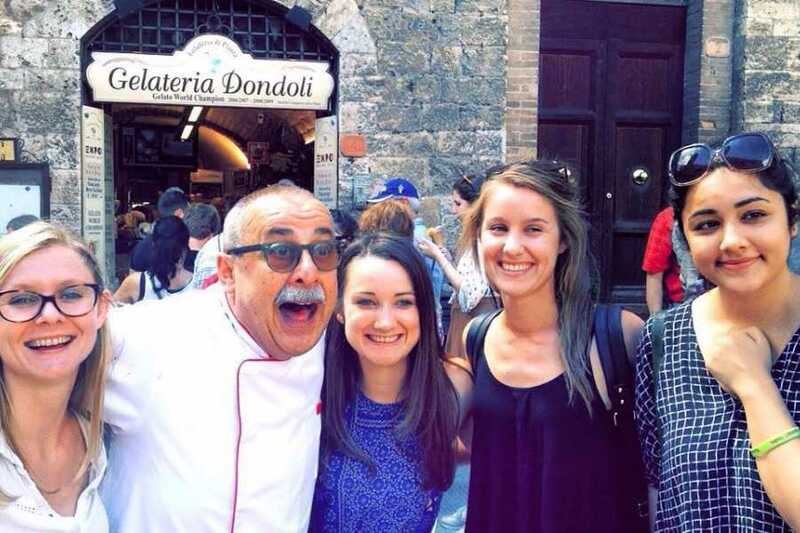 > A minimum of experience is required and highly advised. 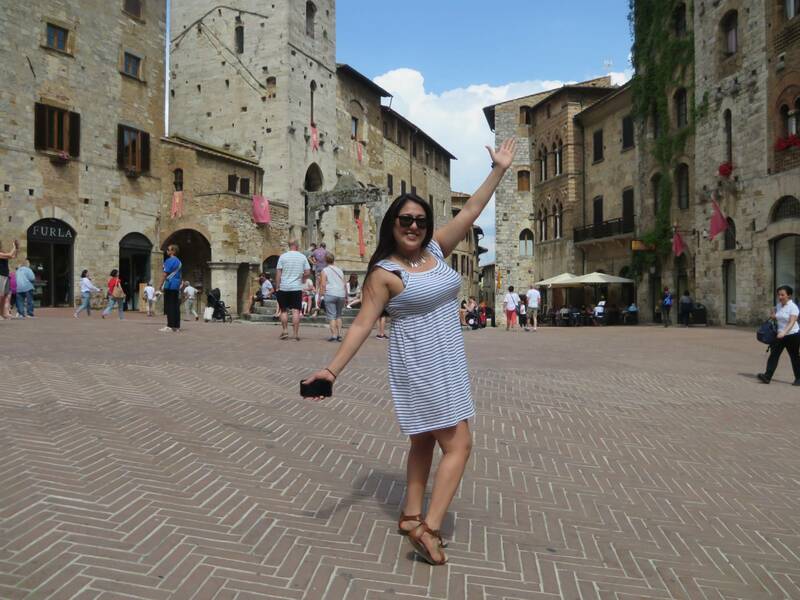 See the important notes on the itinerary sections. 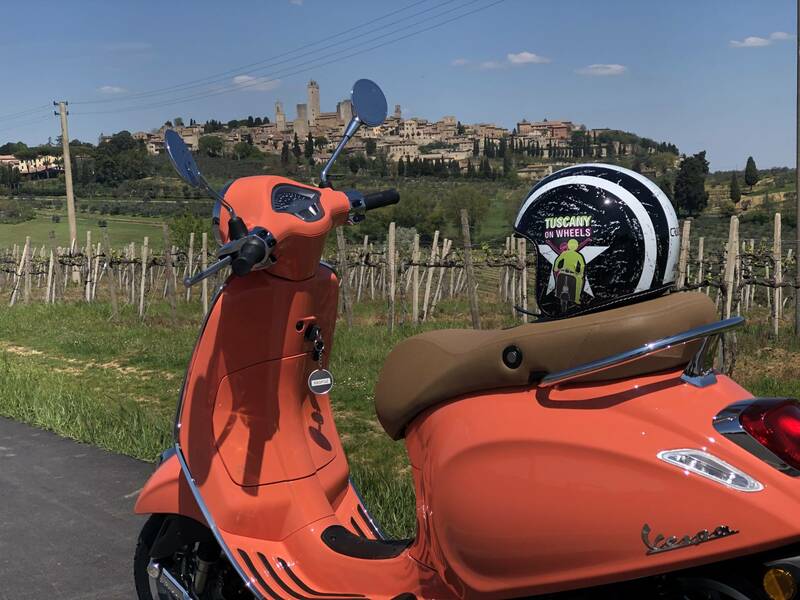 Finally reach our headquarter located in the heart of the Chianti region to receive an orientation conducted by your IOAB tour leader, ensuring the safe operation of the Vespas before we head out for our engaging and enjoyable ride (see notes at the bottom). 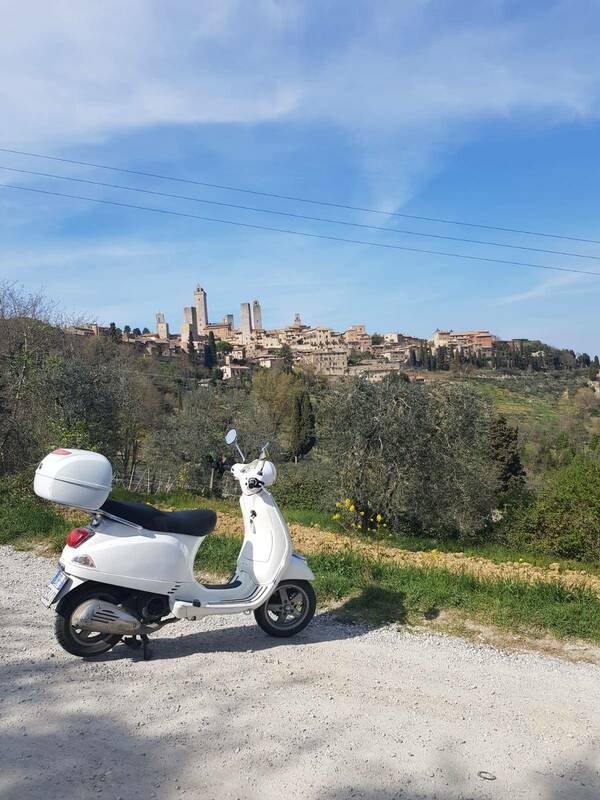 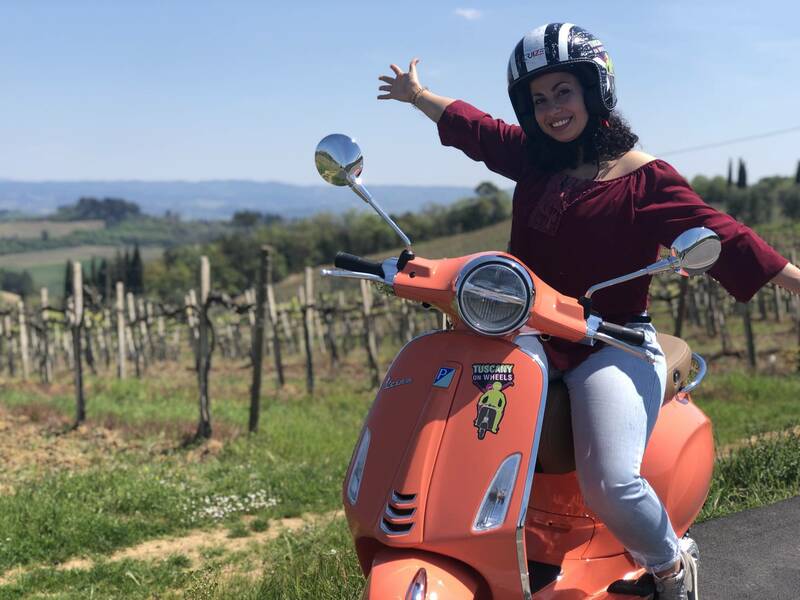 Start the vespa ride on quiet and scenic roads through the rolling hills of the Chianti region where some of the most famous Tuscan wines are produdes and fall in love with the fields of vines, cypresses and Tuscan rural houses. 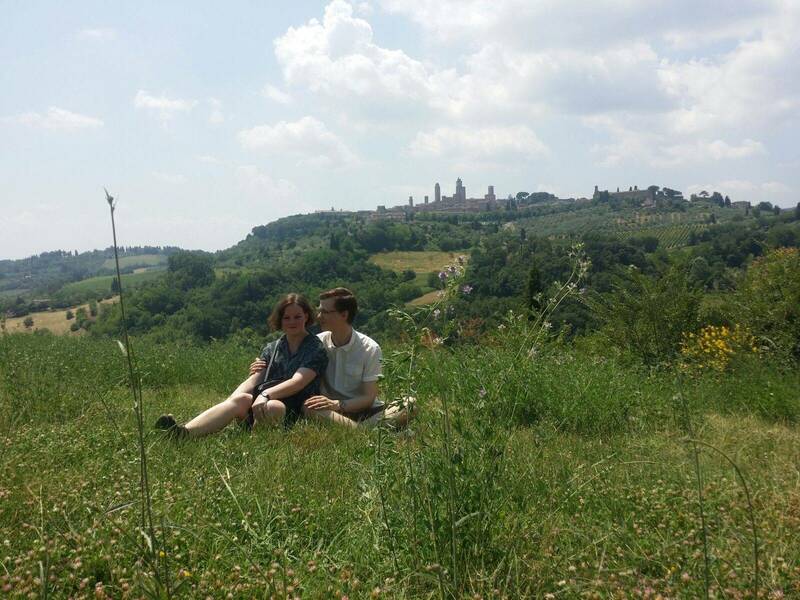 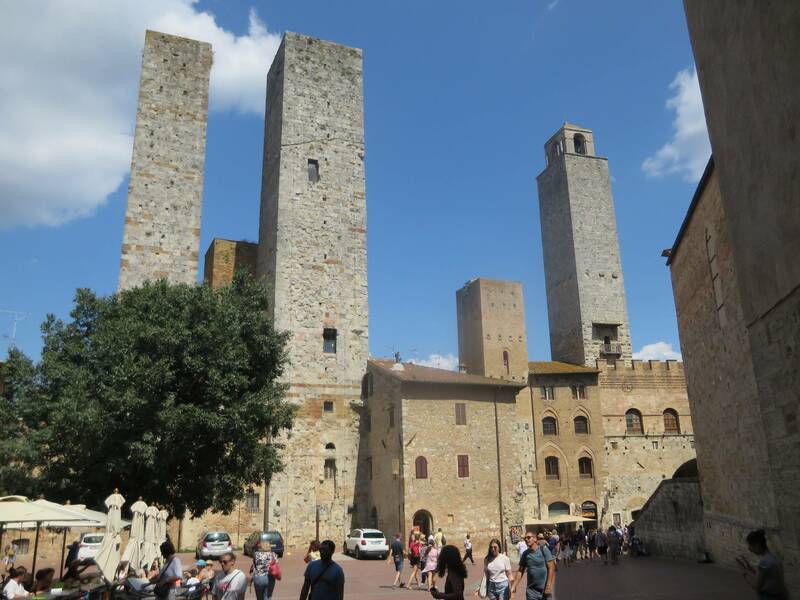 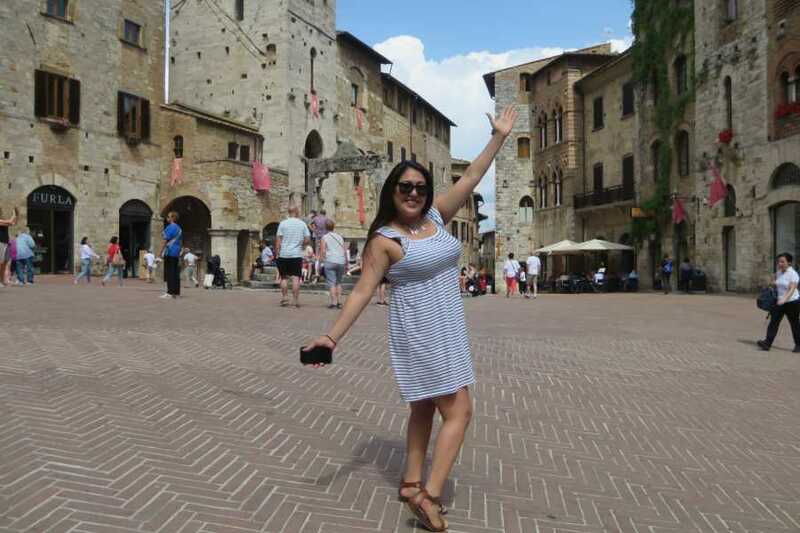 Along our itinerary we are going to visit the famous Medieval town of San Gimignano and check out the tower filled skyline while eating the ice cream from a world-champion gelateria. 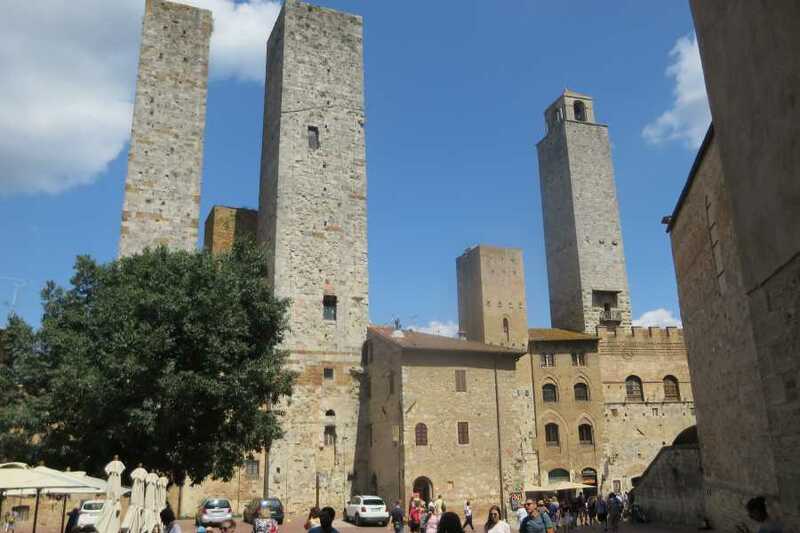 Maps will be provided from your tour leader and tips about the best places to visit in the town. 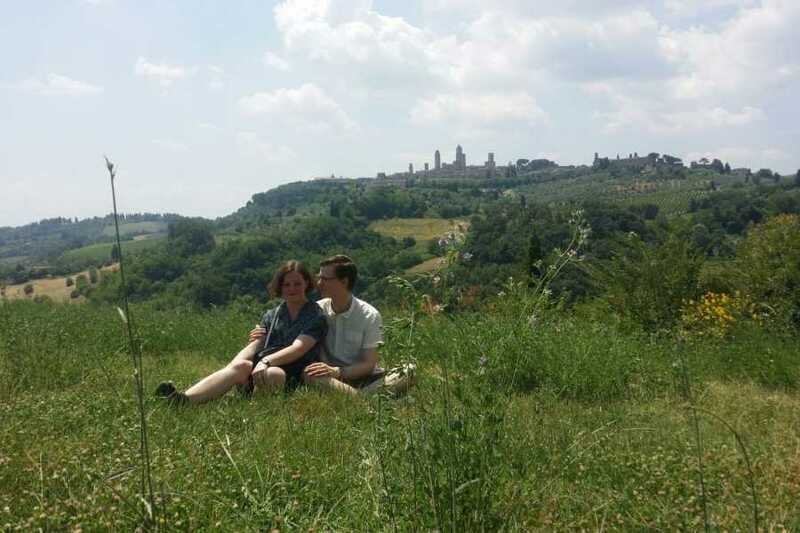 We'll then visit a local winery to enjoy an authentic tuscan meal combined with a light wine and olive oil tasting. 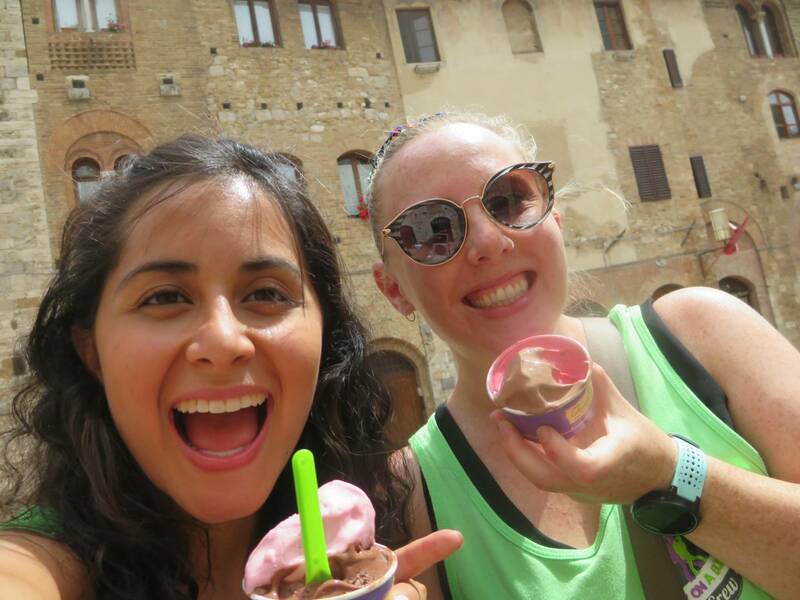 ** all departure/ arrival time are all estimated and are subject to change due to road conditions and traffic. 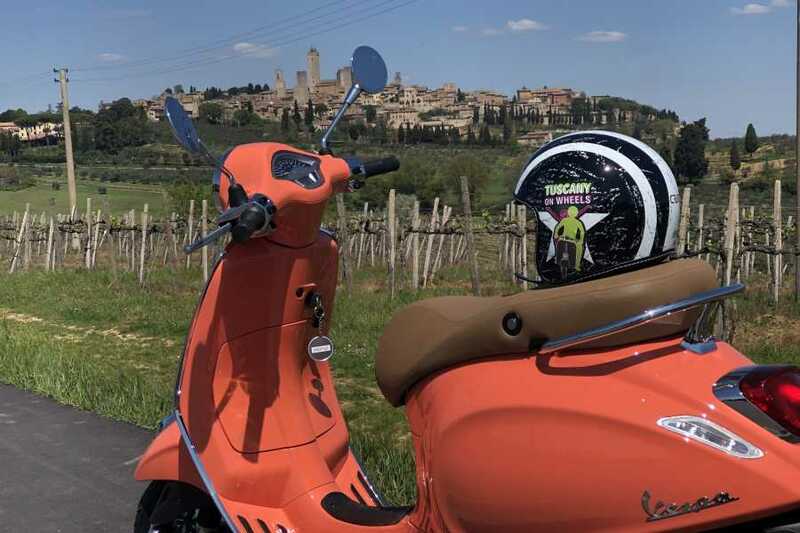 > A valid driver's license is required (you need to have it with you on the tour). 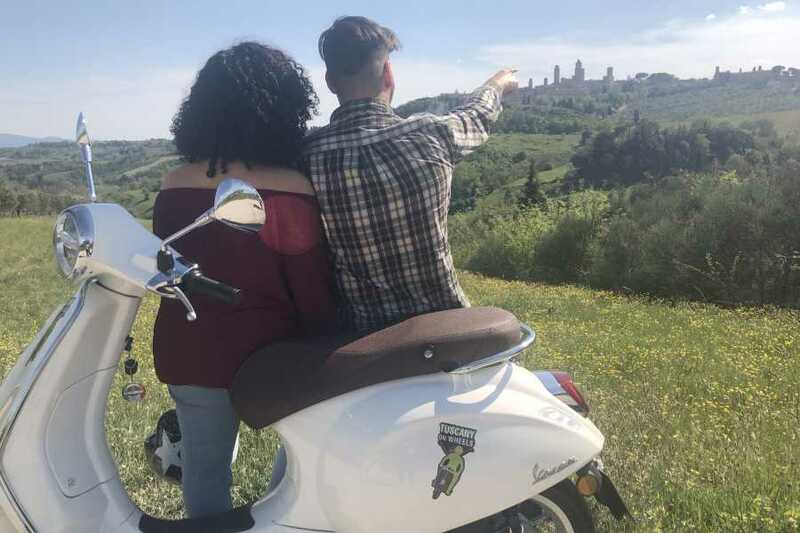 You do not need a motorcycle license. 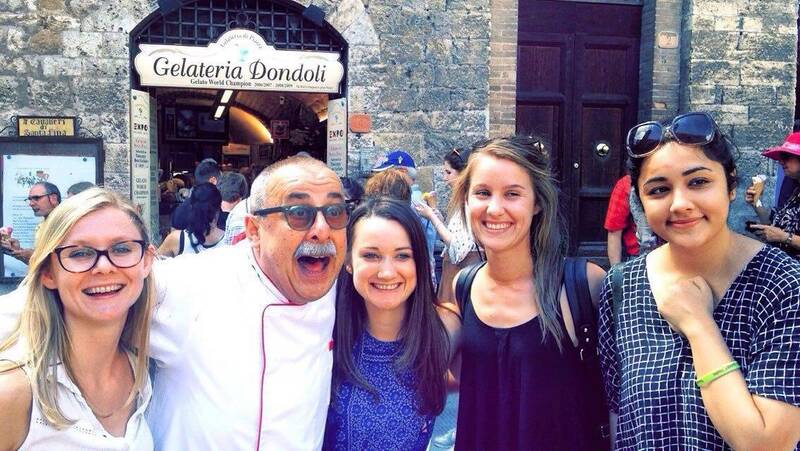 > You must be at least 18 years of age. 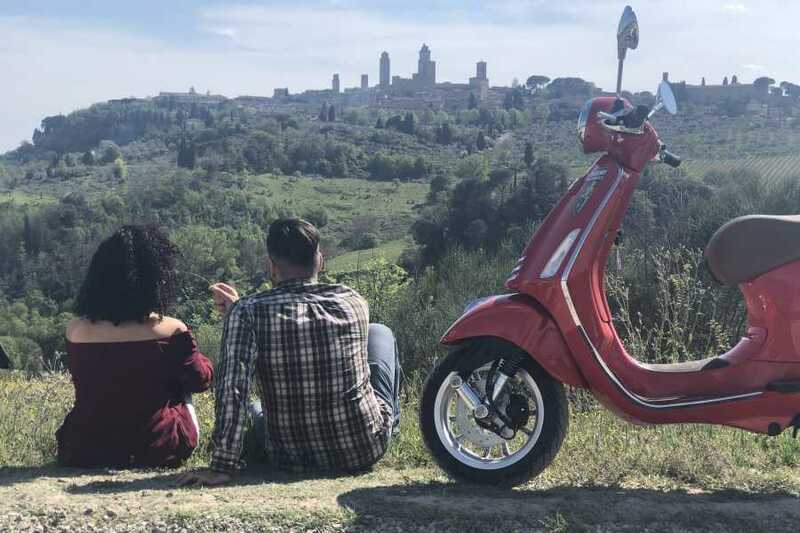 > If you do not feel comfortable driving, you can choose to ride as a passenger with your partner. 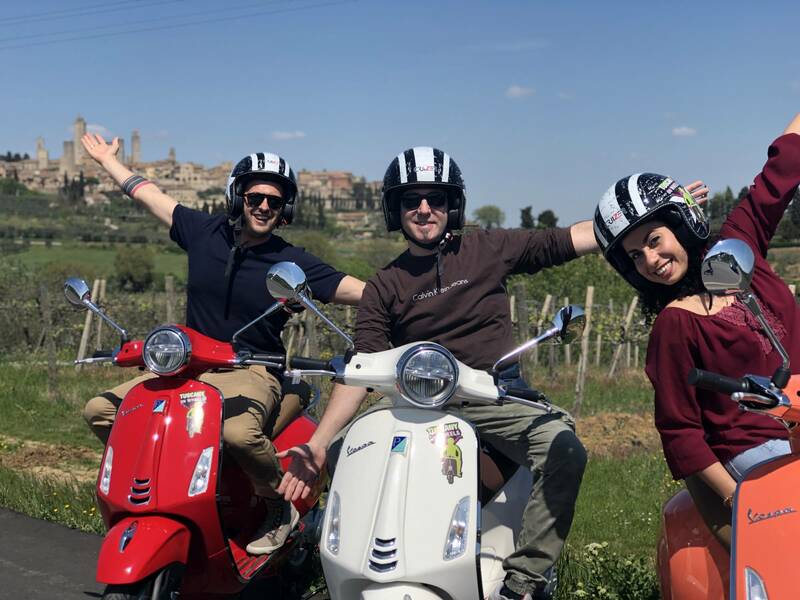 > We reserve the right of final judgement in client participation of actual scooter driving or in client being a passenger, or to discontinue scooter use at any point of the tour. 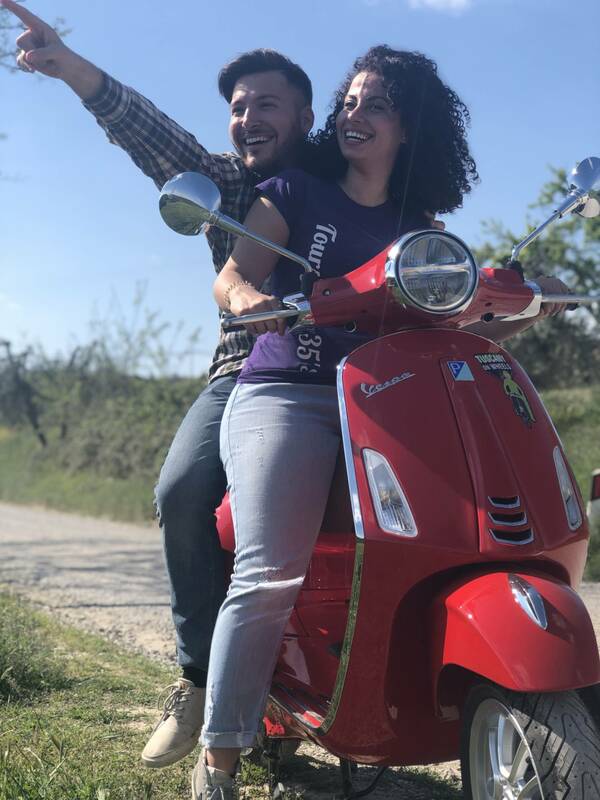 > Any participant unable to drive scooters safely may ride double with a partner, or on the guide’s scooter if available or continue the tour on board one of our support vehicles if unable to be a safe passenger as well. 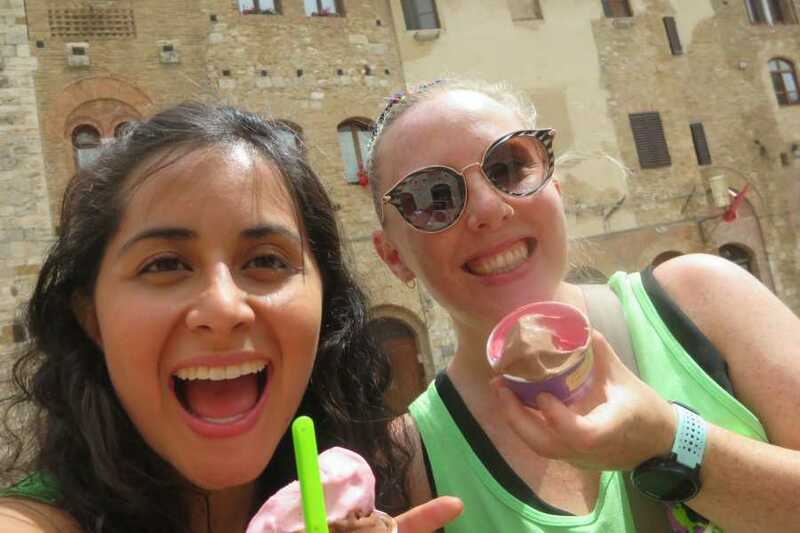 No refunds will be granted in this case. 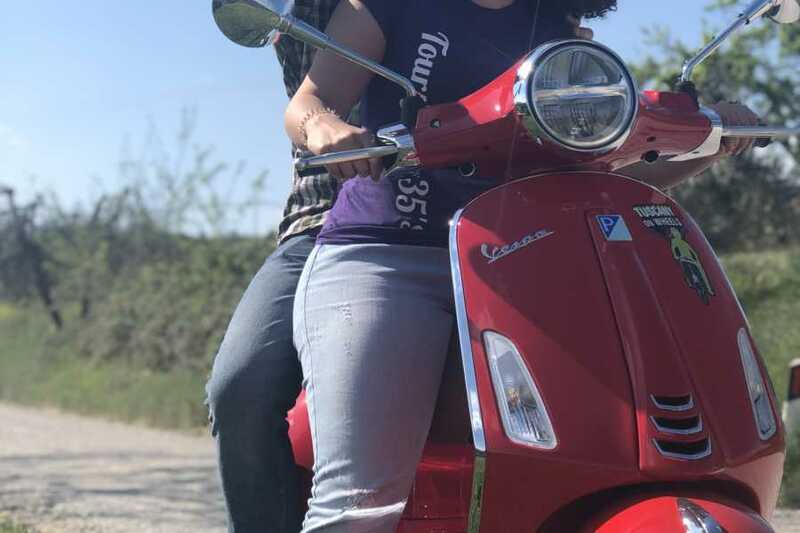 OUR FIRST AND FOREMOST CONCERN IS EVERYONE’S SAFETY.